(CNN) -- The U.S. Embassy in Yemen, which was closed over the weekend because of security concerns, reopened Tuesday, a day after Yemeni forces conducted successful security operations. A statement posted on the embassy's Web site said "successful counter-terrorism operations" conducted by Yemeni security forces on Monday, north of the Yemeni capital, Sanaa, addressed "a specific area of concern and have contributed to the Embassy's decision to resume operations." 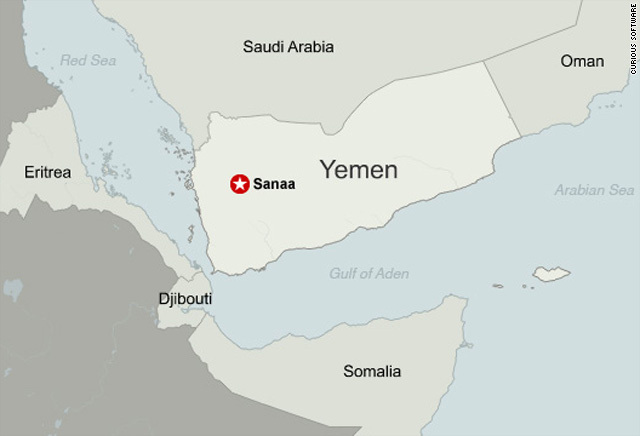 However, Mohamed Ahmed al-Haniq, the al Qaeda unit's leader, and an unknown number of his "companions" were able to escape during the clashes, SABA reported, citing Yemen's Interior Ministry. The U.S. Embassy said the threat of terrorist attacks against American interests in Yemen "remains high," and it urged American citizens in the country "to be vigilant and take prudent security measures." A senior State Department official, who did not want to speak on the record because of the sensitive nature of the information, said Yemeni authorities have helped the United States with additional security precautions at the embassy site. The United States' decision to close its embassy came after intelligence suggested that four al Qaeda operatives were planning an attack on the compound, a senior administration official said Monday. The official said the United States had information that a group of eight terrorists had been planning an attack. Yemeni forces killed three in recent days and another was captured wearing a suicide vest, but the other four were believed to be at large, the official said. It was not immediately clear if the same al Qaeda members in Monday's clashes were among the group of eight suspected terrorists. U.S. lawmakers have highlighted what they say are the threats posed by terrorists in Yemen. "As we commit ourselves to the fight in Afghanistan, some of the what I'll call the enemy forces, the extremist forces, move to new bases of operation such as Yemen, from which they strike us," said Sen. Joe Lieberman, I-Connecticut, at a news conference with Sen. John McCain in Iraq Tuesday. "I've been quoting something that was said to us by an American working in Yemen when Sen. McCain and I visited in August, which was perhaps a bit overstated but it makes a point. He said to me: 'Iraq was yesterday's war. Afghanistan is today's war. And if we do not act preemptively now, Yemen will be tomorrow's war.'" McCain noted that on the visit he had a "very strong impression" about the nation's difficulties, particularly the presence of al Qaeda. "The government of Yemen is going to need our help in combatting al Qaeda," McCain, R-Arizona, said. "There needs to be significant effort made in improving their economy, and we cannot allow Yemen to be a base for al Qaeda to mount attacks on other countries in the region as well as the U.S."
On Monday, U.S. Secretary of State Hillary Clinton called the situation in Yemen a possible threat to regional and global security, but commended Yemen for taking action against al Qaeda networks. The United States and Britain closed their embassies Sunday. Britain's Foreign Office also cited security concerns and its embassy remained closed Tuesday. "The British Embassy in Yemen will remain closed to the public today," a statement from the embassy said. "Some embassy personnel will be in and whoever needs to contact the embassy can do it via the phone or e-mail but people won't be able to walk into the embassy." Several other nations also made changes at their Yemen-based embassies Monday, including Japan, France, Spain and Germany. Each cited the need for increased security measures. France closed its embassy to the public, although French Foreign Ministry spokesman Bernard Valero said Tuesday that embassy employees will continue their work. Valero said the embassy will reopen once work to secure the site, already in progress before the latest threat, is finished. Spain also restricted public access to its embassy, the Spanish Foreign Ministry said, adding that the embassy continued to function "normally." Japan halted service at the consulate section of its embassy. The Japanese Foreign Ministry said the decision was based on the threat of terror, not a specific threat. Germany said that while its embassy remained fully operational, security measures were increased. The German Foreign Ministry said fewer visitors were allowed into the embassy compound. The wave of concerns follow last month's alleged attempted terrorist attack by a Nigerian man who boarded a flight in Amsterdam, Netherlands, and allegedly tried to detonate explosives hidden in his underwear as the flight approached Detroit, Michigan. The attempt failed, and other passengers and crew grabbed the suspect. The Yemen-based al Qaeda in the Arabian Peninsula claimed responsibility for the Christmas Day plot. U.S. President Barack Obama has also linked the suspect, Umar Farouk AbdulMutallab, to the group, which is a combination of al Qaeda networks in Saudi Arabia and Yemen. The AQAP group in Yemen has said that the attempted attack on the airliner was in retaliation for airstrikes against it on December 17 and 24. However, Yemen has said that AbdulMutallab purchased his ticket on December 16.